Inside Speciality Food's Dairy magazine 2014: cheesesellers reveal their top cheeses, favourite cheesemakers and hottest selling cheeses. We find out how to build the perfect cheese counter with The Courtyard Dairy and Cambridge Cheese Co. Skilled cheesemakers Billy Kevan of Colston Bassett and Mary Quicke of Quicke's Traditional talk technique, while traditional cheesemakers at Keens Cheddar, Barbers and Ford Farm explain the continuing hold of strong and vintage Cheddar. Read our guide to Continental cheeses and meet four top producers of blues. 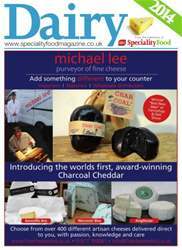 Also in a packed issue: crumbly cheeses, artisan butters and cream, yogurt and a celebration of British cheese.